Anderson, Taylor. Destroyermen: Into the Storm . NAL/Roc 2008. What if: The dinosaur extinction event never occurred and there exist in the present day sentient races of saurians and mammals. 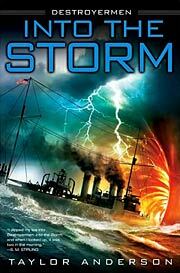 Series note: Series including Into the Storm , Crusade , Maelstrom , Distant Thunders , Rising Tides Firestorm , Iron Gray Sea , Storm Surge , Deadly Shores , Straits of Hell , Blood in the Water , Devil's Due , River of Bones , and Pass of Fire . 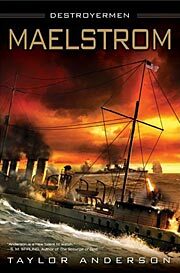 Summary: In 1942, two American destroyers fleeing Japanese pursuit in the Java Sea sail into a squall and exit into an Earth populated by two intelligent races in conflict. Series note: First volume of Destroyermen. Published: NAL/Roc 2008 (0451462076w88 android), 2009 (0451462378BUY). Series note: Second volume of Destroyermen. Published: NAL/Roc 2008 (0451462300BUY), 2009 (0451462572BUY). Anderson, Taylor. Destroyermen: Maelstrom . NAL/Roc 2009. Series note: Third volume of Destroyermen. Published: NAL/Roc 2009 (045146253XBUY), 2010 (0451462823BUY). Series note: Fourth volume of Destroyermen. Published: NAL/Roc 2010 (0451463331BUY), 2011 (0451463706BUY). Anderson, Taylor. 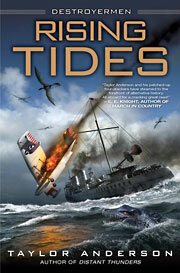 Destroyermen: Rising Tides . NAL/Roc 2011. Series note: Fifth volume of Destroyermen. Published: NAL/Roc 2011 (0451463889BUY, 0451464060BUY). Series note: Sixth volume of Destroyermen. Published: NAL/Roc 2011 (0451464176BUY), 2012 (0451464389BUY). Series note: Seventh volume of Destroyermen. Published: NAL/Roc 2012 (0451464540BUY); Ace 2013 (0451414233BUY). Anderson, Taylor. 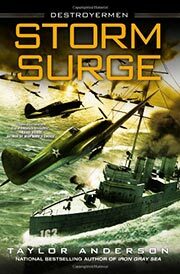 Destroyermen: Storm Surge . NAL/Roc 2013. Series note: Eighth volume of Destroyermen. Published: NAL/Roc 2013 (045146513XBUY); Ace 2014 (045141909XBUY). Series note: Ninth volume of Destroyermen. Published: Ace 2014 (0451465660BUY), 2015 (045146835XBUY). Anderson, Taylor. 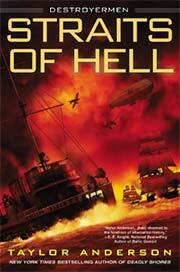 Destroyermen: Straits of Hell . Ace 2015. Series note: Tenth volume of Destroyermen. Published: Ace 2015 (0451470613BUY), 2016 (0451470621BUY). Series note: Eleventh volume of Destroyermen. Published: Ace 2016 (045147063XBUY), 2017 (0451470648BUY). Anderson, Taylor. 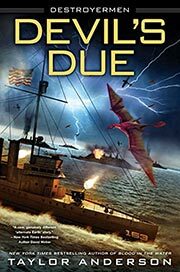 Destroyermen: Devil's Due . Ace 2017. Series note: 12th volume of Destroyermen. Published: Ace 2017 (0451470656BUY), 2018 (0451470664BUY). Series note: 13th volume of Destroyermen. Series note: 14th volume of Destroyermen. Published: Not yet published; expected from Ace in June 2019 (0399587535BUY).